In this article, I will talk in terms of outdoor power equipment, small 2 cycle engine oil. Lubrication reduces friction, which in turn reduces wear on the internal engine parts. Engines that have separate oil containers, like cars, need oil changes periodically. In the case of two stroke engines, a small engine oil change isn't necessary. The 2 cycle oil mix is right in the gas. Two cycle engine oil must be mixed with the gasoline in 2-stroke engines in order for them to stay cool during operation. See what I did there? I used the word cycle and stroke interchangeably in the same sentence. the piston traveling from the top dead center to the bottom dead center of its cylinder or from bottom to top dead center of the cylinder. The two words, 'cycle' and 'stroke', have the same meaning. A "2 cycle" or "2 stroke" means that there are 2 full movements that the piston makes per fire: up and down. Is one two stroke engine the same as another, and therefor the oil is the same? No, TCW3 2 stroke marine oil is formulated for water cooled engines. They do not run as hot as air cooled, outdoor power tool small engines. Power equipment needs oil for hotter temperature - air cooled engines. Furthermore, one 2 cycle engine might ask for different ratios of oil mix than another, but every 2-cycle engine is lubricated through its fuel system. You have to use 2 cycle engine oil. You have to use the right 2 cycle engine oil mix. What happens when fuel with no 2 cycle oil mixed into it, gets used in power equipment? If straight gas, or too weak of a 2 cycle gas mix is poured into outdoor power equipment, the piston rubs hard against the cylinder. The resulting friction causes excessive heat which seizes the engine. The proper 2 cycle oil mix is necessary to lubricate the cylinder and piston. You have to use the proper ratio or mix of oil to gas in two cycle engines. There is a 2 cycle oil mix chart below for the mixture so you can follow it to ensure the proper amount of oil in your gas canister before pouring it into the tool. For safety sake, it is better to mix more oil than less oil if you're unsure of the ratio or of the amount of gas that you have. Since a 50:1 gas to oil mixture takes 2.6 ounces of 2-cycle oil per gallon of gasoline, here are the calculations for mixing 2.6 ounces of 2 stroke engine oil into different amounts of gas. Every 2-cycle engine has a specific gas/oil mixture ratio, and most 2-cycle tools display the correct gas/oil ratio somewhere on the tool, usually the engine housing. Regardless, you can count on the owner manual having the ratio information. A 50:1 gas to oil ratio is very common in today's outdoor power equipment, but check yours individually. Older tools tended to use more oil in their mixture. The 50:1 gas to oil ratio is much cleaner burning combustion. In retail outlets, a common bottle size of oil is 2.6 ounces, suitable for adding to a 1-gallon container for 50:1 mixtures. Before you mix the oil into the gas, ensure it is the right amount per gallon for your tool. Of course you have to know how much gas is in your canister first. If you have multiple tools requiring different ratios, then label each gallon gas container as to what ratio of oil was added so that you don't later use the wrong mixture in the wrong tool. Sometimes a 2 cycle engine oil manufacturer will specify their own mix ratio to use instead of whatever the power equipment manufacturer specifies. The 2 stroke oil you choose, should burn cleanly, control friction and help prevent wear, plug fouling, ring sticking and exhaust port blocking with anti-rust formulation. A smokeless formulated synthetic 2 stroke oil or blend will burn cleaner. Some will stipulate what oil mix they're good for, i.e. a label may state, "up to 50:1 2 cycle oil mix" or "up to 100:1 2 stroke mix." 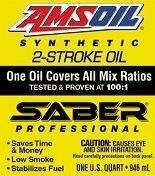 This Amsoil SABER Professional is tested and proven at 100:1 mixture ratio. 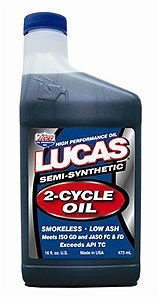 The Lucas 2-Cycle Oil at HL Supply, is an advanced technology smokeless 2-stroke oil formulated from a special blend of mineral oil, synthetic oil and a low ash additive package containing fortified dispersant inhibitors. The end result is a more thorough burning of the fuel resulting in more power and fewer emissions for a safe operator environment. User can expect less fuel consumption and no more filter clogging! The special lubricants in the Lucas 2-stroke oil allow for a much easier piston travel; this condition allows for more net power and less ring and cylinder wear. Shop for Oils & Lubes at HL Supply.